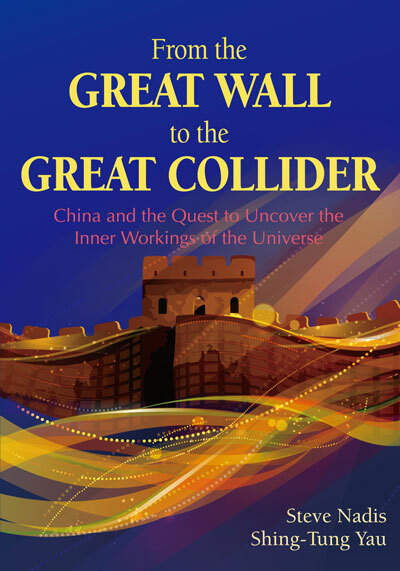 With a long delay, last week I was finally able to have a look at the book "From the Great Wall to the Great Collider - China and the Quest to Uncover the Inner Workings of the Universe", by Steve Nadis and Shing-Tung Yau. And I would like to report about my impressions here. First of all, appearances. Aren't they everything ? The book comes in hardcover with a graphics hinting at the great wall of china and particle trajectories, on a purple background. It is a lean book, 170 pages all in all, and with the slightly larger than usual 7.5"x10" format. It is typeset in a clean and readable format, with 40 lines of text per page. And it contains no less than 47 pictures, most of them in color, illustrating notable characters of the play, accelerators, detectors, and facilities. Curiously, the figures are captioned but not numbered, so there is no explicit pointer to them in the text. Another feature worth mentioning is the presence of a thick list of references, taking 24 pages of the text. That's 15% of the whole book! 12 more pages at the end contain an index of topics and names. The book is undoubtedly lean because it has a very well-defined focus: it tells a story. This is the story of the idea of bringing to China the leadership in high-energy particle physics. It starts with a prologue which is titled "The Next Great Wall". I must say that while it is awesome to learn about the gigantic project of the great Chinese wall, which defended the country from invaders from the north, I find the analogy with the construction of the next hadron collider a bit thin, and even worrisome. A wall is something that prevents the mixing of culture and peoples. It defends by hindering contacts and flows. A wall is a concept of the past, and as awesome and beautiful the architecture of the great wall may be, the underlying idea is not one that we should base science on. Science thrives in open communication and distribution of information. And China must still demonstrate that they are all for this - the limitations to the use of internet in China comes to mind... All this is to say that I found the analogy a bit like a shot in one's own foot. Anyway, diatriba mode off - the book has nothing to do with foreign politics of China -at least not in the defence department. So the book is quite readable and understandable by non-experts, and if you are interested to see how a big project is conceived and starts, and to follow the first steps of what could be the biggest scientific endeavour of the 21st century, the book is one you should not miss. For it does look like China could really end up hosting the next 100-TeV-scale hadron collider. I do hope China will stand by this project and push it forward as hard as it needs to. But I remain sceptical on the benefits to fundamental science of a 100 TeV collider. If the LHC does not discover any new physics at 13-14 TeV, then the factor of 7 increase in energy does not guarantee any return. While the LHC can be argued to have already justified its existence, in discovering the Higgs boson and allowing its study, a future collider appears a steep bet as far as scientific returns are concerned. So we really need to hope that ATLAS and CMS will show their diphoton bump is real now... That would by itself become a motivation for a revived investment in HEP!